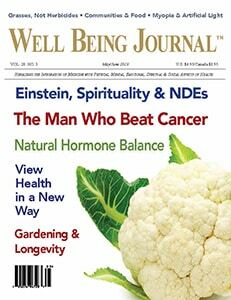 Christopher Wark, in this interview with Well Being Journal editor Scott Miners, discusses his colon cancer diagnosis, surgery, and how he healed with nutritious foods and stress management instead of chemotherapy. Ocean Robbins, CEO and founder of the Food Revolution Network, addresses several of the top kinds of foods that prevent and heal cancers, including mushrooms and cruciferous vegetables. Leonardo Trasande, MD, an international leader in children’s environmental health, outlines the dangers of chemicals that lead to change in gene expression generationally and are toxic to the endocrine-glands. The author suggests we can lower the levels of hormone-disrupting chemicals in our environments. Christiane Northrup, MD, in this wide-ranging interview with Ari Whitten, host of the Energy Blueprint podcast, speaks of hormone replacement therapy, discussing premarin, which is made from mare’s urine and its effects, and bioidentical hormones, such as progesterone, which exactly match those made in the body. The interview also focuses upon everyday natural actions, such as optimal amounts of sunlight, and foods and particular herbs as well as supplements that help balance hormones naturally. Karina Gordin, MSc offers pragmatic insight about the optimal ways to combine certain nutritional supplements. Shannon McRae, PhD, explains, using a case example, how simple physical conditions or ills oftentimes derive from emotional distress caused by repetitive negative thinking. By using medical intuition, that is, intuitive insight accentuated by a knowledge of anatomy and psychology, a medical intuitive can help others find and heal the cause of diseases. How Can NDEs Be Real if Having One Means You are Crazy? Melvin Morse, MD, author of Closer to the Light, discusses his studies and several cases of near-death experiences (NDEs ) that show how those who have had NDEs bring spiritual inspiration to society.